Uighers are an ethnic minority in western China, largely Muslim, who have been protesting the Chinese government for its discriminatory policies against them over the past several years. Now the Chinese government hopes to appease the protesters with a bizarre princess story. Historically, China has been ruled by the dominant Han ethnicity. But in the country's western regions, there are many Islamic groups with a different ethnic heritage — their ancestors likely came from various parts of the middle east over 1500 years ago, and they have been uneasily assimilated into Chinese society ever since. In the early twentieth century, Soviet leaders dubbed these many different groups "Uighurs," naming them after a vanished tribal society that once aided the Chinese in quelling the deadly rebellion of the short-lived Yan Empire during the middle ages. Throughout the past two millennia, clashes between these ethnic groups and the Han Chinese have been frequent and bloody. The latest bout of unrest is no exception. But now the government is trying to use television to smooth things over. She is the Han vision of a Disney princess transplanted to Xinjiang. 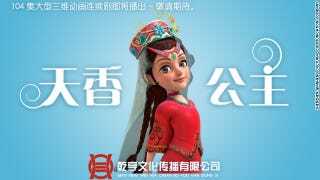 Animators in the southern Chinese city of Shenzhen are creating a 104-episode cartoon series loosely based on a historical Qing Dynasty imperial consort, the Fragrant Concubine, a Uighur woman who is shrouded in myth. Working under contract with the government of the oasis city of Kashgar, the site of occasional violent episodes, these animators have said their aim is to paint a portrait of ethnic harmony and paper over bloody conflicts in Xinjiang. The plot of the series, which is expected to be broadcast in 15-minute-long episodes over two seasons, follows the adventures of Princess Fragrant, her brother and their ethnic Han and Kazakh friends as they travel across Xinjiang to rescue the princess's father from the clutches of a greedy Western explorer. "It shows that ethnic unity is the most powerful weapon in the face of adversity," said the director, Deng Jiangwei, in a telephone interview. "The princess and her friends also encounter other ethnicities and cultures along the Silk Road, and they learn that only by helping each other can you go far in life." Key to ethnic unity, I suppose, is finding another ethnicity that we can all be angry about. In this case, I'm guessing that will be whatever ethnic group produced our "greedy Western explorer." Despite all the weird politics surrounding the creation of this series — and the fact that this princess is definitely Han-ified — I'm eager to see it, and I hope we get a subbed version outside China. It's rare to see Uighurs represented as heroes, and it would be terrific to have a swashbuckling tale of a Uighur princess on the silk road. The Princess Fragrant series may be propaganda, but it still sounds kind of amazing.